We’re moved into our new place and I’m back in the kitchen! Did that feel like forever or what? I’ve missed home cooked meals and writing about my kitchen experiments! I read an article awhile back breaking down the nutritional info of different greens. I was surprised to see that romaine boasted a high protein content for a green and I remember thinking that I wish I liked it more. Romaine is boring, right? It’s at the bottom of the barrel for me, second only to lame iceberg. Ick. Fast forward a couple of months and I’ve been seeing grilled romaine Caesar salads everywhere and I’ve been actually craving one. In my post-move stupor however, I bought a bunch of romaine hearts and then realized we had no Caesar dressing. Or croutons. Talk about putting the cart before the…salad? I decided to season the romaine hearts really simply so we could each choose our own dressings but as it turned out, we ate them as is. This roasted romaine is so simple and tasty on its own. Tom was totally skeptical of this method but he actually said to me, “I am SHOCKED at how good that was.” The greens get warm and the edges get crispy for a perfect Summer side dish. 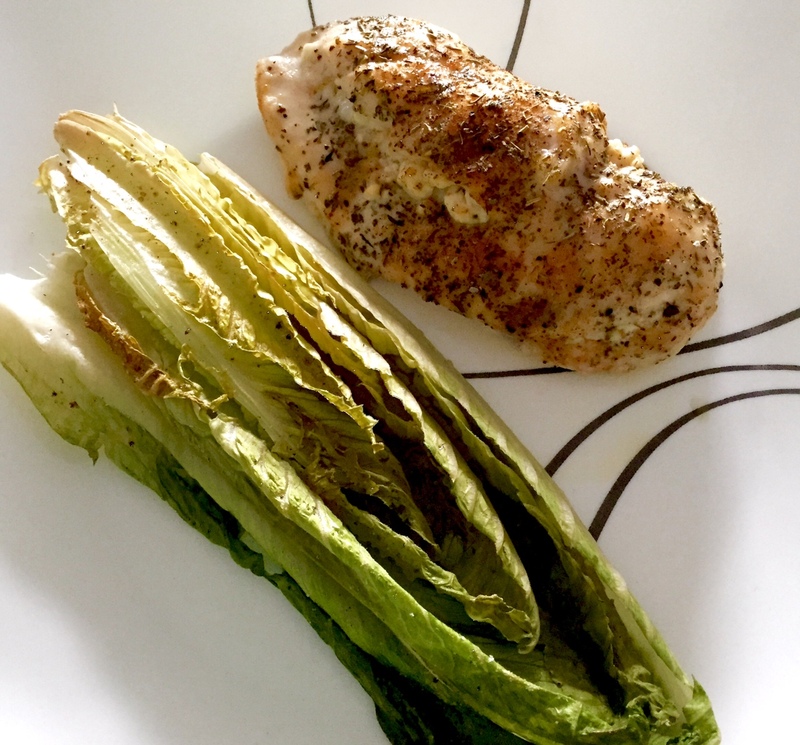 Alongside our shockingly delicious roasted romaine were some sweet and savory herbed chicken breasts stuffed with feta. These were also easy to throw together but felt a little bit fancier for a weeknight meal. Definitely could fall into special occasion territory. I’ve missed you! Let’s eat! Preheat oven to 400 degrees. Slice a pocket in the side of each chicken breast, almost cutting it in half but leaving a flap. Fill each hole with 1 ½ tbsp. of the feta cheese and lay the chicken breasts in a baking dish. Drizzle the chicken with olive oil and sprinkle each one with ½ tsp. of Italian seasoning and ½ tsp. brown sugar. Sprinkle with seasoning salt and cracked black pepper. Bake for 30 minutes or so until chicken is cooked through. Preheat oven to 400 degrees. Slice the romaine hearts in half lengthwise and cut the hard ends off. Lay on a baking sheet cut side up. Drizzle with olive oil and sprinkle generously with cracked black pepper and a pinch of garlic salt. Roast for 5-10 minutes or until edges of the greens start to brown and get crisp. Remove from oven and serve!